This reply was modified 8 months, 3 weeks ago by vaporl. OVNS JC01 Pod kit comes with slim card-shaped appearance which is portable and comfortable to hold in hand. The JC01 Battery is compatible with JC01 CBD Tank, JC01 E-liquid Pods and JUUL Pods. (Both JC01 Pods and CBD Tank also can use JUUL Battery). Both of them can hold 0.7ml liquid. The CBD Tank uses Ceramic coil to ensure long lifespan and purer taste. The JC01 battery has 400mah built-in capacity. When JC01 is working, No.4 LED light will be on. The above 3 LED lights are power indicator. The smart MCU chipset brings better instant inhale experience. Aspire with the collaboration of Halo features the Gusto Mini AIO system; a robust and low profile ultra portable device system that features a built-in 900mAh battery, an output wattage of 17W, and a 4.2ml capacity pre-filled pods. The Gusto Mini is a single button operated device with a maximum output of 17W and an atomizer range of 1.5 ohm. A built-in 900mAh LiPo battery powers the device and an LED battery life indicator shows users its battery life, if the device drops below 3.5V, the indicator light turns red. 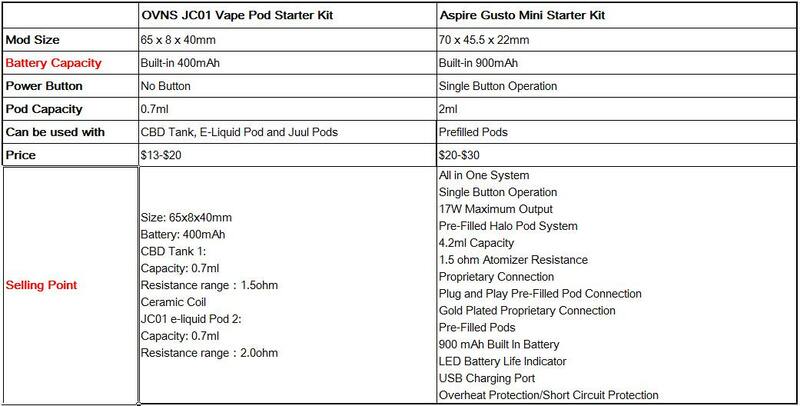 The Gusto Mini uses pre-filled Halo pods, capping at 4.2ml of E-Liquid. The pre-filled pods enter the device through the slidable cover, after pulling off the silicone plugs allow the pod to rest in the device for 5 minutes to properly wick. The Gusto Mini by Aspire is a simple and convenient all-in-one, ultra portable system that is perfect for users looking for a sleek, covert, all-day vaping device! The Smok TFV12 Baby Prince vape tank provides all the cloud chasing and high intensity flavour that you’d expect from a Smok sub ohm tank, with a host of new features. Features a new childproof filling mechanism, that increases safety and prevents accidental opening; this is coupled with durable construction and a 2ml fill capacity. What really sets the Baby Prince apart from other sub ohm tanks, is the new range of smok coils that it fits. With three coil types available, you can tailor your vape experience. The Q4 is the classic 0.4 ohm coil that’s cross compatible with the TFV8. The Smok V8 Baby T12 Red Light Replacement Coils produce massive vapor, great taste and illuminate a bright red light! They managed to fit a total of 12 coils; the result is massive cloud production! Chase clouds like a boss with this power hungry coil option. Vandy Vape Pulse BF Squonk Kit comes with unregulated Pulse squonk box mod and Pulse 24 BF RDA-Special Edition. It features lockable power switch for safety concern, spring loaded 510 connection and a 8ml food grade soft silicone bottle, ideal for squonking. Compatible with 18650 and the new 20700 batteries, two access points on the back for easy removal of battery and bottle. The Pulse 24 BF RDA-Special Edition has 2ml ejuice capacity, follows an unique leak resistant tubular side direct airflow and 4 spare philips screws can ensure to easy to build. Pulse BF Kit offers you wonderful vaping experience.. The Geek Vape Aegis Legend 200W Starter Kit continues the legacy of the epic Aegis series, integrating an update chassis to accommodate dual 18650 batteries and increases maximum power output to 200W with the intelligent AS Chip. Maintaining the high-level of shock-absorbency and withstanding dirty environment, the Aegis Legend 200W Box Mod is constructed with die-cast aluminum alloy frame, advanced LSR Injection Moulding technology, ergonomic leather grip, and carbon steel battery door cover. The battery section is bottom-loaded, allowing for easy installation of dual high-amp 18650 batteries (sold separately) via a hinged lock mechanism for proper securement. A rocker-inspired firing button in a trigger-style structure provides user-friendly operation, with a full-color OLED display screen for organized informational readouts. The Aegis Legend has a maximum wattage output of 200W, and several output modes, such as: Power Wattage, VPC, TC-TCR, and BYPASS Mode. Here comes the AUGVAPE BTFC(Bottom Top Flavor Cloud) RDA. The BTFC RDA is 25mm in diameter, providing a spacious deck for easy building. The BTFC RDA features adjustable double airflow system – top airflow and bottom airflow. The dual-post deck is very easy to install coils. The four air holes on the build deck brings direct airflow underneath the coil to maximize flavor. The AUGVAPE BTFC RDA is switchable between 810 Delrin drip tip and 510 drip tip with an included adapter. The pack also comes with a BF pin for squonker MODs. Just get the AUGVAPE BTFC RDA and enjoy your vape. The Vaporesso Zero 650mAh Starter Kit is the new pacemaker for all refillable POD systems. It comes with 2ml capacity tank which adopts a new innovative filling system – press to fill which allows easy filling and improved leak prevention. Unique CCELL coil is optimized for high nicotine satisfaction. The Omini Board Mini integrates auto temperature control and multiple protections. The massive 650mAh battery is built in and can be quickly charged to full within 45 minutes. All of these are the perfect mix to give you an easy vaping life. Shop Rincoe Ceto Pod System Kit Now! Are you look forwarding to an all-screen vape mod, Vaporesso Luxe Mod is coming. Comes with an Interchangeable Magnetic Battery Door and a wide range of atomizer accessory, the Vaporessl Luxe 220W Box mod is powered by dual 18650 batteries, the Vaporesso Luxe Kit is capable of 5-220W output range, resistance range of 0.03-5ohm, and various firing modes, such as VW, temperature control mode and by poss mode. Features an easy-to-read OLED screen for easy to check vaping data. More information iwll come soon. The Rincoe Manto features a powerful 228 watt capable temperature control mod. The Manto features a huge 2.0″ TFT color display screen with a beautiful and eye popping 3D user interface. The Manto features an almost instantaneous firing speed of approximately 0.002 seconds for immediate satisfaction. The Manto features a lightweight zinc alloy construction with a smooth finish that is perfect for all day vaping. The Manto is powered by (2) high amp 18650 batteries (sold separately) and may be recharged via the front micro USB charging port. The SMOK X-Priv features a high-definition 2.0″ screen equipped with updated user interface. Powered by two 18650 batteries (not included). 225W maximum output wattage with inlaid chipset featuring TC, VW, and Memory mode. Lateral fire key and up/down buttons on the lower right corner of the face. Newly upgraded user interface allows for color screen customization, and displays detailed vaping information, including puff monitoring, voltage, and battery life. Firmware upgrade capable. Hello folks, how are you? Vaporl Mid-Year Vape Promotion is still goning on, we pick two suprise to you, not only can get 10% off for all orders by coupon code “MID10”, but also have a chance to get a free high-end giveaway vape geras. The Pulse X RDA feeds the juice directly to the top of your coils, giving you the experience you would get with typical dripping atomizers, and saturating your wicks and coils from the top. This ensures that your coils are always wet and ready to go. When squonking, the one-way-valve design allows excess juice to return to the bottole at the bottom. It also allows you to drip right onto the center through the drip tip for non-squonk usage, and the liquid rolls off the top center of the post and onto your coils. The “X” design for the post can be used effectively for vertical and horizontal builds, and can accommodate large or small coils. Note: Don’t forget to use “MID10” to get an extra 10% off discount! Advken Manta Sub Ohm Tank 5ml comes with 30mm Pyrex glass tube and 810 Resin drip tip. It features top filling design and adjustable bottom airflow system. Besides, the tank features sliding top cap for easy top filling and adjustable bottom airflow. It comes with 0.16ohm and 0.2ohm Mesh Coil, which would bring you different vaping experience. The Manta Tank utilizes 0.16ohm/0.2ohm Mesh coil head. What’s more, the Mesh coil is compatible with Dominator Tank,FV8 Baby Tank and NRG Tank. The TFV12 Prince Cobra Edition is a 7ml unprecedentedly powerful and exquisite subohm tank with beautiful snakelike patterns carved on the top and base to bring you great visual enjoyment. Comes with a unique cobra mesh inside which makes you see the beautiful “shape of the e-liquid” clearly and brings you a stable vape. Together with the cobra V2 resin drip tip, easy top filling with patented locking mechanism and the revolutionary TFV12 Prince coils, the TFV12 Prince Cobra Edition is definitely a great vaping tank for you!